The boys try to instigate a fight between Tweek and Craig. Meanwhile, Mr. Adler the shop teacher is haunted by a recurring dream of his lost love. Stan, Kyle and Cartman join shop class. Kenny takes home economics instead to stay away from the shop's dangerous equipment and so he can be with the girls. When the wood shop instructor Mr. Adler asks who the classes' biggest troublemaker is, Stan and Kyle say it's Tweek while Cartman maintains it's Craig. To settle the issue they provoke the two boys to fight, despite the initial lack of animosity between the two. 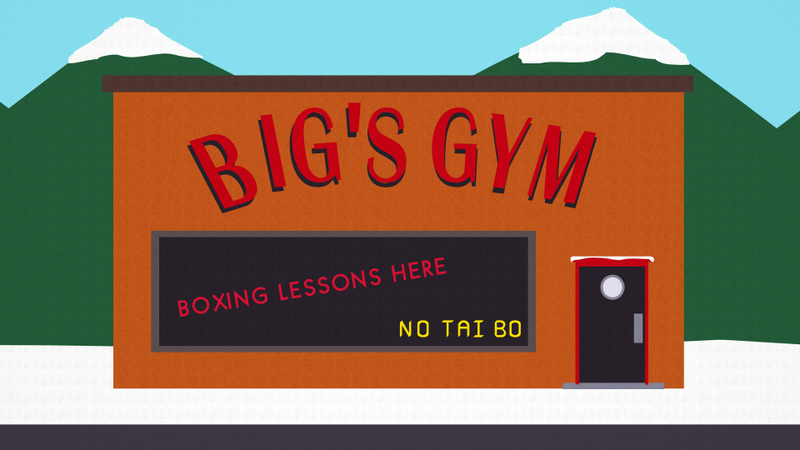 Craig learns sumo with Cartman, while Tweek gets boxing lessons from Jimbo and Ned. They finally engage in a bloody schoolyard brawl unmatched until "Cripple Fight". At the same time, Mr. Adler is in deep mourning for his dead fiancee, shown through live-action flashbacks, was killed in some sort of airplane/drowning incident. On the day of the Tweek/Craig matchup, Mr. Adler becomes too distraught over her death and lies down in front of a circular saw to cut himself in half. Suddenly Tweek and Craig crash through a window, startling Mr. Adler out of his suicide plan. It also startles Kenny (recently booted from home economics and forced to take shop), who gets caught in some heavy equipment and hurled across the room into a box of rusty nails. As Kenny lays dying, he channels the spirit of Mr. Adler's dead fiancee. The two reconcile, right in front of the crowd of children who were watching the fight. 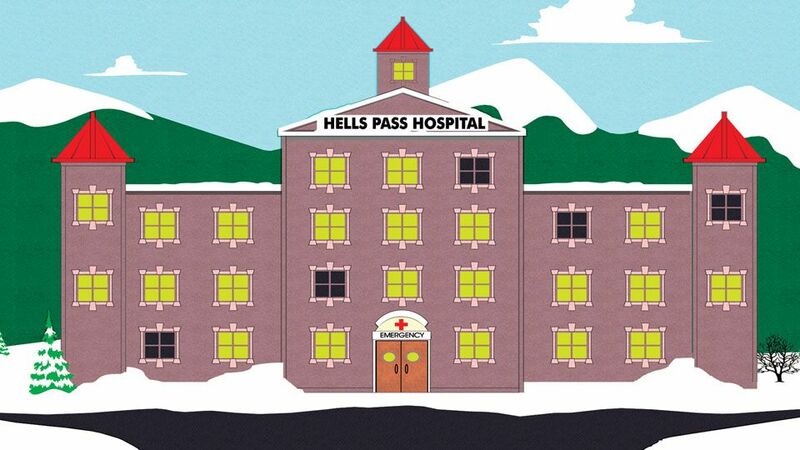 Later, the kids go to the hospital to visit the severely injured Tweek and Craig. They tell the two boys their families were both on the TV news, calling each other names. A brawl starts yet again to the delight of the children. "Saying goodbye doesn't mean anything. It was the time we spent together that really matters. Not how we left it." This episode makes the first appearance of Craig's parents and little sister. We learn his whole family likes to give the middle finger. Token Black makes his speaking debut, uttering a very deep "Yeah, they left." Token's voice becomes more high-pitched starting from "Cartman's Silly Hate Crime 2000" which includes his first major role. We also meet Richard Adler the shop class teacher and Pearl Choise the home economics teacher. They date but Mr. Adler refuses her sexual advances, still distraught over his fiancee's death. Mr. Adler's fiancee, who dies repeatedly in flashbacks. Apparently she was flying a plane which crashed or blew up. Then she fell in the water and drowned. Also Kenny who uses his last whim to channel the spirit of Adler's dead fiancee, grandma, and uncle. A 3rd grader named Tommy isn't killed, but loses his face to a belt sander in shop class. 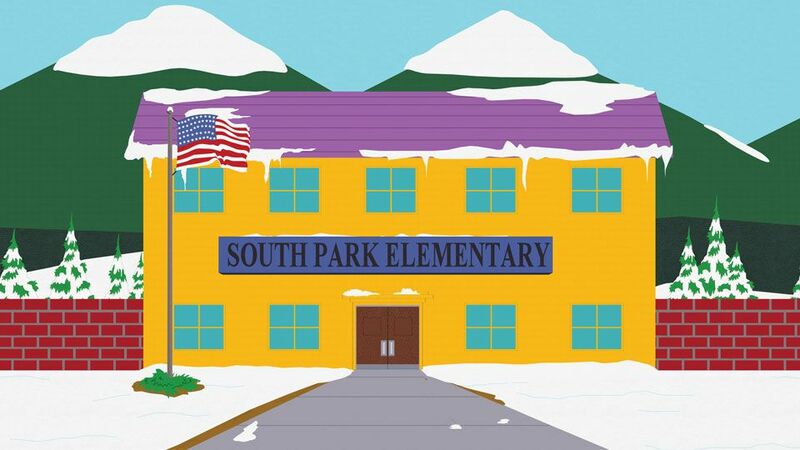 "Tweek Vs. Craig" was the last South Park episode to air before the film South Park: Bigger, Longer & Uncut was released one week later in the United States. This episode also features Mr. Adler's flashbacks as live action segments. The writers spent a day filming South Park former writer Pam Brady, who acted as Mr. Adler's fiancee, playing on swings and pretending to fly. Trey and Matt think the scenes are weird but hilarious. Trey in particular loves the part where her plane loses control and blood spurts all over her before the plane even crashes. The character of Mr. Adler is based on one of Matt's own shop teachers in elementary, whose real name is bleeped out in the creator commentary. Mr. Adler's flashbacks are a reference to the 1987 cyberpunk film Robocop. The titular character would have repeated memories of his previous life of his wife and children throughout the film. In some of the flashbacks Mr. Adler's fiancee says "It's all for you Richard". This is another reference to the 1976 horror film The Omen. The line is uttered by a young nanny played by Holly Palance to the character Damien. A parody of "Gonna Fly Now", the theme famously used in the training montage of 1976 film Rocky, plays as the kids meet for Tweek and Craig's first brawl. Craig's favourite show Red Racer may be a parody of Speed Racer, the Japanese animated franchise about auto racing. In Japan the series is known as Mach GoGoGo. Jimbo teaches Tweek a boxing strategy called the "Oppenheimer technique" which involves hitting your opponent in the balls. This is likely a reference to J. Robert Oppenheimer, who was one of the American scientists involved in the Manhattan Project, a development project of humanity's first nuclear weapons during World War II. The home economics teacher tells Bebe to "dump that zero and get yourself a hero". This was a common catchphrase said by actress and television presenter Ricki Lake when giving dating advice to female guests on her show Ricki Lake. We learn a lot about Craig this episode. He watches Red Racer every day of the week, flips the bird more than he talks, and has a guinea pig named Stripe. His relationship with guinea pigs is further explored in "Pandemic" and "Pandemic 2: The Startling". Craig and Tweek's confrontations this episode inspired a lot of romantic shipping between the two in the South Park fandom. Craig/Tweek or Creek remains one of the show's most popular pairings despite, for several years, having only one episode that revolved around the two. Trey and Matt, confused but inspired by fan art of Craig/Tweek, later created "Tweek x Craig" to discuss and resolve this pairing. This episode features the iconic scene where Cartman dresses up in a Sumo outfit. We learn from his sumo instructor Nishimura that he has natural gift for the sport. 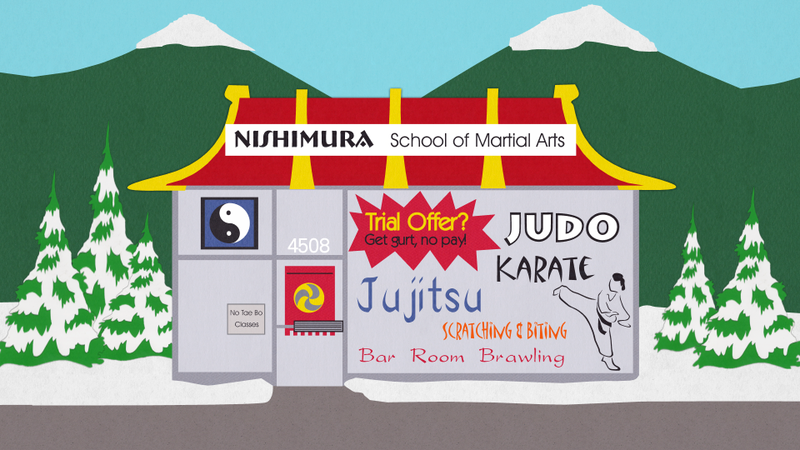 On the Nishimura Martial Arts building, along with "Judo", "Karate", and "Jujitsu" it lists "Scratching and Biting" and "Bar Room Brawling".